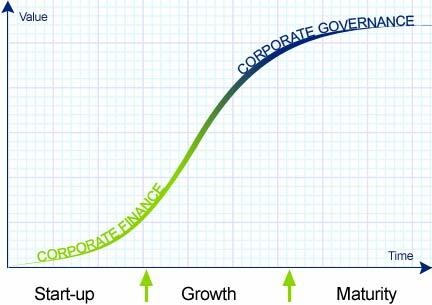 The graph opposite illustrates the profile of how dynamic companies create shareholder value during their corporate life cycles. Each of these three phases, Start-Up, Growth and Maturity, carries with it not only the potential to enhance shareholder value, but also significant risks which can reduce or eliminate shareholder value. Timely and experienced advice during each of these three phases can help mitigate these risks, and therefore optimise shareholder value.